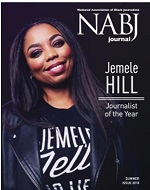 WASHINGTON (April 23, 2015) – Investigative reporter Nikole Hannah-Jones today was announced the 2015 Journalist of the Year by the National Association of Black Journalists (NABJ). 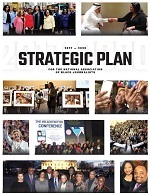 The annual award recognizes a black journalist who has distinguished himself or herself with a body of work that has extraordinary depth, scope and significance to people in the African Diaspora. Hannah-Jones won for her body of work about the continuing segregation of America’s schools. The stories – which she wrote for ProPublica – offer a critical exploration of access to opportunity and educational equity. Hannah-Jones, who recently was hired by The New York Times Magazine, also has written extensively about housing discrimination and the ongoing litigation of affirmative action, including recent Supreme Court cases such as Fisher v. University of Texas. An “NABJ Baby,” Hannah-Jones participated in NABJ's internship program and was placed at The News & Observer in Raleigh, N.C., while pursuing her master's degree in mass communications at the University of North Carolina, Chapel Hill. Hannah-Jones will be honored with others at the association's Salute to Excellence Gala on Aug. 8 during NABJ's Annual Convention and Career Fair in Minneapolis. The gala recognizes journalism that best covered the black experience or addressed issues affecting the global black community in 2015. Her coverage of federal failures to enforce the landmark 1968 Fair Housing Act won several awards, including Columbia University’s Tobenkin Award for distinguished coverage of racial or religious discrimination. Her reporting has been featured in The New York Times, The Atlantic Magazine, The Huffington Post, Essence Magazine, The Week Magazine, Grist, Politico Magazine and on Face the Nation, This American Life, NPR, The Tom Joyner Morning Show, MSNBC, C-SPAN, Democracy Now and radio stations across the country. The impact of Hannah-Jones’s reporting on school segregation was felt in the national debate on race as well as in the relations between two high schools in Tuscaloosa, Ala. It also was felt in scores of school districts across the country, where students and their families were unaware that court orders requiring greater integration of their schools were still operative. In addition, Hannah-Jones’ reporting impacted federal education and civil rights officials who had to concede their oversight of legally mandated requirements for equal educational opportunities were broken. Before going to ProPublica, Hannah-Jones worked at The Oregonian, where she won the Society of Professional Journalists Pacific Northwest Excellence in Journalism Award three times. She also was honored with the Gannett Foundation Award for Innovation in Watchdog Journalism. Hannah-Jones has gone on reporting fellowships to Cuba and Barbados, where she wrote about race and education. NABJ congratulates Hannah-Jones on this well-deserved honor.